Gibraltar was heavily featured in maritime shipping accidents recently, notably for engine failure which can be due to the EMP caused by ripping rock. Considering that this website covers the entire world, for 15% of the postings within the week to be about disabled ships at Gibraltar is notable, and both about engine failure from an unknown source. The product tanker Chrisopigi Lady lost propulsion power after engine failure in Gibraltar Strait. The vessel was en route from Milford Haven in UK to Port Said in Egypt, but remained adrift at Gibraltar Strait approach from Atlantic ocean. The product tanker Chrisopigi Lady was disabled within the separation scheme and requested immediate assistance due to navigation danger for the nearby vessels. The general cargo ship Langeoog suffered mechanical failure and remained adrift in Gibraltar, shortly after leaving the port of Algeciras. The vessel started to drift south off Europa Point in eastern Gibraltar, being navigation danger for the heavy traffic in the strait. The weather was fresh and there was no immediate danger for the seaworthiness of the ship, but crew was unable to restart the engine and requested assistance by the local authorities. 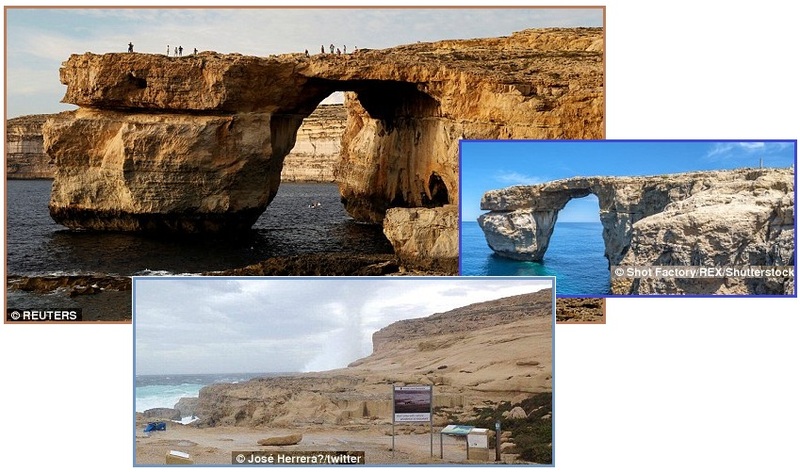 Then two days later the famed Azure Window at Malta collapsed, which the establishment claims was caused by high winds. Solid rock, blown down by high winds. Even if one considers that erosion by waves was a factor, the rock was surely footed on other rock, so unless this rock was moving, shifting during the African Roll, this collapse should not have happened. 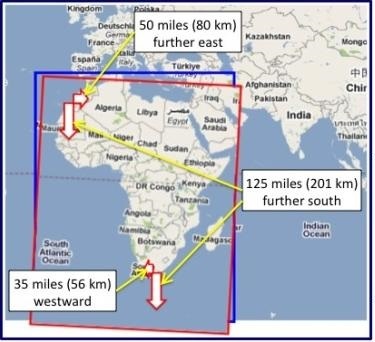 Per the Zetas, Gibraltar will spread further apart by 125 miles during the African Roll. This is in process! Malta's famed Azure Window has crumbled into the sea after being pummelled by stormy weather. Geologists had long warned that the arched cliff structure, on the north-western coast of the small island of Gozo, was eroding and last year visitors had been banned from walking on top of it or sailing beneath it. But their prediction came true and the natural wonder dramatically collapsed. We learned during the October 21, 2016 DDOS attack that crippled the Dyn servers, that the Internet of Things could be taken over and used for nefarious purposes. At that time such innocent devices as a coffee maker were used to flood the Internet with transactions. But Wikileaks has revealed during its Vault 7 releases that the CIA went beyond that. The CIA has been using common devices and installed software to spy on whomever is nearby – Samsung TVs, Android smartphones, and WhatsAp among them. 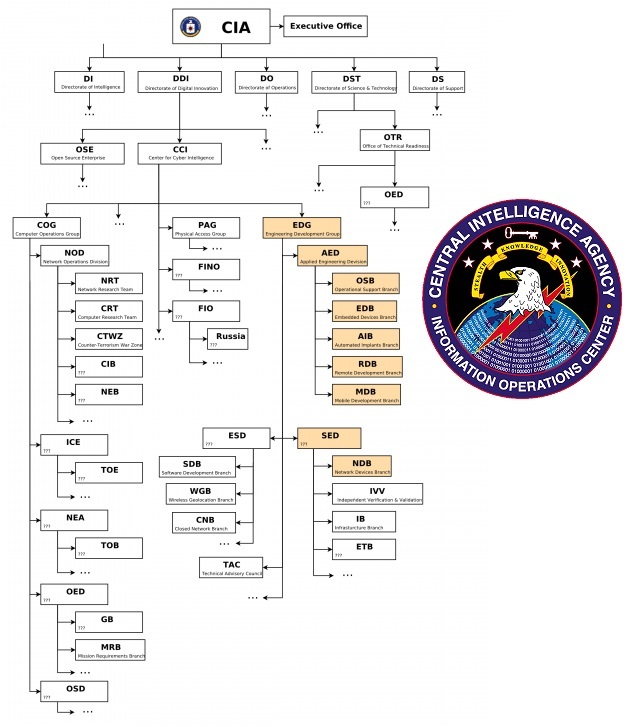 The leaks have revealed the CIA’s covert hacking targets, which included computers, smartphones, routers and even smart TVs infiltrated for the purpose of collecting audio, even when the device is switched off. The Google Android operating system, used in 85 percent of the world’s smartphones, was also exposed as having severe vulnerabilities, which allowed the CIA to “weaponize” the devices. The US government hackers were able to access data from social messaging platforms, including WhatsApp, Weibo and Clockman before encryption. 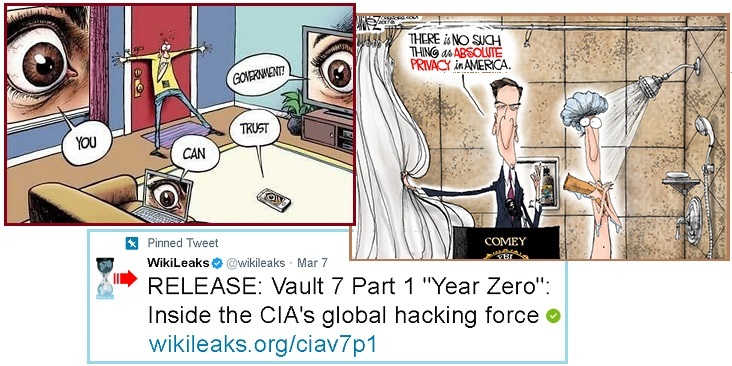 The Vault 7 release on March 7, 2017 included admissions from the CIA’s own files that they could easily spoof a hacker’s identity, making it seem a hack had been done by the Russians when in fact it had been done by others. Remember all those hacks of the DNC and Podesta email files, supposedly done by the Russians? We said at the time that it was not the Russians. The Russians are not that sloppy. The Hillary hugging Washington Post and CNN and even Obama shouted out that it was the Russians. All lies, now revealed. But there is more to come! WikiLeaks has published what it claims is the largest ever release of confidential documents on the CIA. It includes more than 8,000 documents as part of ‘Vault 7’, a series of leaks on the agency, which have allegedly emerged from the CIA's Center for Cyber Intelligence in Langley. Another profound revelation is that the CIA can engage in "false flag" cyberattacks which portray Russia as the assailant. CIA uses techniques to make cyber attacks look like they originated from enemy state. It turns DNC/Russia hack allegation by CIA into a joke. So the hunt is on to discover the mole in the CIA, or the contractor gone bad, or the hacker emeritus who was able to hack into the CIA’s most secret and secure database housed in the center of CIA headquarters at Langley! Per the Zetas, this person will not be found, as the true hackers cannot be admitted by the establishment. The Zetas explain. ZetaTalk Insight 3/11/2017: Will the CIA ever find the mole in the agency that handed over the documents? Giving lie detector tests and injections with truth serum will not locate this mole, as he/she does not exist. Nor will the FBI find any such person or route by which the documents might have been smuggled out of the CIA headquarters. Despite metal detectors at entry and exit points, and despite checking all transmissions from every possible electronic port, no such smuggling will be found. They may find some poor soul to be used as a scapegoat, and claim all is now secure, but it will be a lie. So if a mole or insider were not responsible for the theft of the CIA’s most secret documents from the core of the CIA’s facilities in Langley, then how were they lifted? The Council of Worlds, and ourselves working under their auspices, are required to work through humans, as we have stated. We are allowed to manipulate things, but not people. We formerly attested that we worked with millions of humans among the more than 3.5 billion who are now contactees. Those working for Anonymous are truly anonymous, as they themselves are consciously unaware of their status. This is for their protection. We teleport those with computer skills into control rooms, temporarily freeze the humans working there, and afterward teleport our contactees back out. This was done to assure the 2016 election went according to the voter’s wishes, and not per the election fraud put in place by the Hillary crowd. Any passwords or procedures needed are lifted, telepathically, out of human minds and given to our anonymous workers. There are thus no secrets - in a database, on paper or electronic, or held in the memory or brain cells of some human who dare not write or type it down – that we cannot secure and deliver to Wikileaks. There are no secrets. Get used to it. The New Madrid adjustment, whereby the N American plate rips in a diagonal manner to ease the bow tension, pulling the northeast up and the southwest down, has not yet begun. Meanwhile, the tension in the rock builds and is much evident. On February 13, 2017 a seismographic pulse was noted, originating on the East Coast and marching across the continent. The Zetas explain. 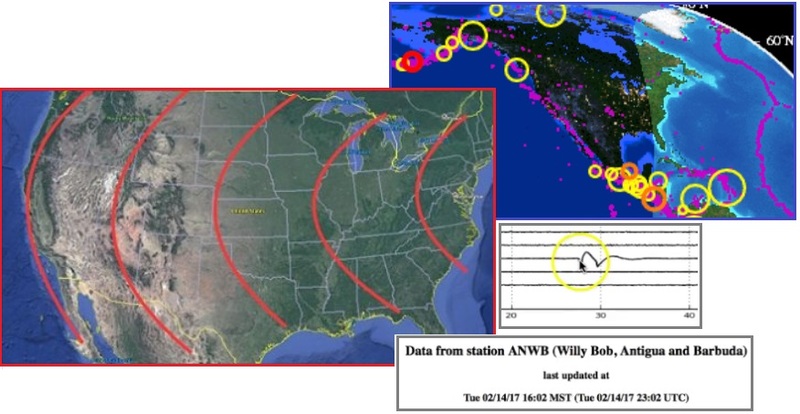 Ground instruments detect strange "pulse" from East Coast to West. February 14, 2017. Seismograms across North America noticed something unusual today, a disturbance of some sort traveling linear across the United States in 2 1/2 to 3 minutes time. These instruments, some many hundreds of miles from each other shared the same odd reading at nearly the same exact time. ZetaTalk Explanation 2/18/2017: This anomaly shows several features of the tightening bow shape forced upon the N American continent. The N American Plate is squeezed so tightly into this bow shape that the rock layers are virtually unable to move. This is represented by the lack of earthquakes in N America. There is no wiggle room amid the rock layers or along the slip-slide fault lines. The rock is jammed tight. This ultimately results in the diagonal rupture that is the New Madrid rupture along the weakest link during this squeeze. The great Mississippi River, running along the drooping thin crust beneath the river, shows that for N America, this is the weak link. In this setting, a tight squeeze, what happens when there is a twitch at some point in the bow? This travels through the rock layers, bridging across any break to a neighboring rock layer, vertically up or down into substrata soil, and essentially traveling outward from the twitch. Why East to West? The twitch also moved Eastward, but there are no seismographs in the Altantic. The original twitch occurred on the highly stressed Eastern Seaboard, where the bow is stretched taut. Then an even more bizarre episode occurred on March 8, 2017. AT&T had a 911 outage, wherein callers in 14 different states trying to reach 911 found their phone ringing and ringing, but never answered. Per the Zetas, this was again related to the bow stress in N America, causing electronic screech in the rock. AT&T, per the Zetas, was using a cross-domain setup, where if the 911 calls they were trying to put through were not moving, it would branch to other phone services to relieve the overload so some available 911 agent could be reached. Why just these particular states? The Zetas explain. ZetaTalk Explanation 3/11/2017: The outage primarily affected states in the New Madrid zone, up along the Mississippi and across at Alabama to the East Coast Fault Line to the Ramapo Fault Line. Texas is riddled with sympathetic fault lines which travel up along the Eastern side of the Rockies through Colorado, and when the New Madrid twitches, the San Andreas likewise twitches, thus California was also affected. 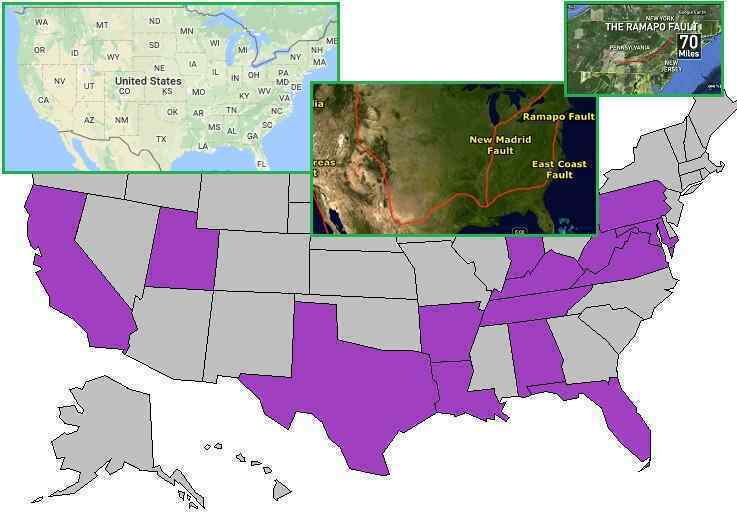 This outage occurred simultaneously in these areas because the entire N American continent, primarily the southern half, was affected by the plate bowing squeeze and consequent electronic screech from the rock. AT&T’s 911 switchboard is configured to allow cross domain calling, if need be, and this configuration was vulnerable. They will fix this. We have heard about elite preppers buying underground shelters, and second homes in the hinterlands, but what about escaping from the city? 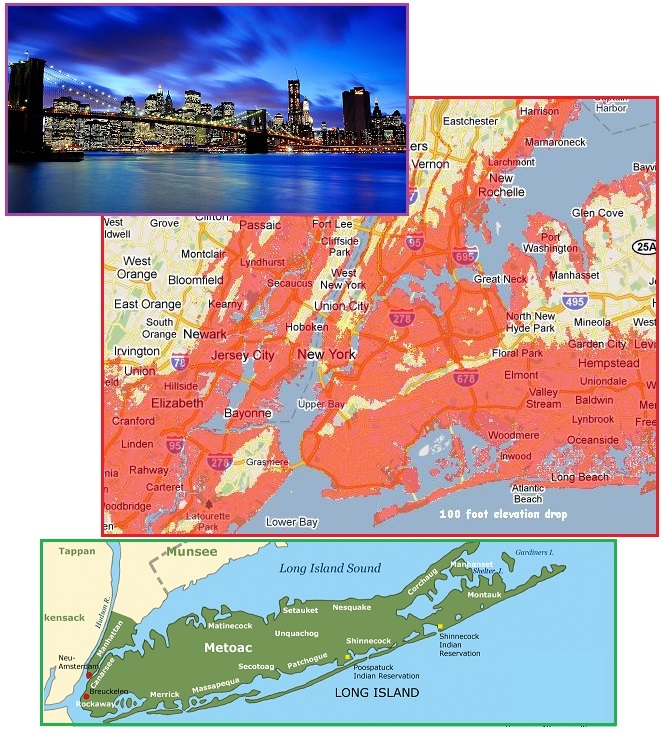 Where all cities have escape route concerns, for New York City there is the issue of being on an island, or a series of islands in fact – Staten Island is one, Manhattan Island is another, with Brooklyn, Queens, and Long Island yet another island. Only the Bronx has an escape route by land. Thus it naturally comes to mind to escape by boat, and an enterprising service is doing just that. Will this work? Per the Zetas, there are so many setbacks that the only plan that can be counted on is to leave the city at or before the Last Weeks. As Hurricane Sandy demonstrated, New York City will flood at a 10-12 foot tide, and at 100 feet most of the city proper will be under water. Something big is coming. There is an inherent dilemma for most of the people living in cities. For now, they are stuck in the city making a living. This is true even for the rich, but now, they have a back-up plan. The biggest of American cities, and one of the most gridlocked, is New York City, with Manhattan and Long Island both isolated islands – trapped during emergencies from the rest of the world. The unique evacuation service costs an annual fee of $90,000 and is catered toward wealthy individuals and corporations who don’t have time to mastermind their own escape. ZetaTalk Prediction 3/5/2011: New York City is one of the most heavily populated areas, and by being a coastal city, has additional strikes against it. For many, on islands along the coast supported by a system of bridges that have been torn apart, they will have no escape. Fires and the howls of the injured and desperate make travel through such a devastated area literally life threatening. Those who stay in New York City during the coming cataclysms are either ignorant of what is about to occur, courageous, or harboring a death wish! Parts of New York City begin getting flooded at 10-20 feet, and the entire city area will be under water at 100 feet. This means that your skyscrapers, if left standing, would have 600 feet of water around them. Tall buildings will vibrate at different rates during the earthquakes, bash into each other, and thus collapse. This is in addition to what is known for city dwellers everywhere - exploding gas mains and water mains, so fires cannot be extinguished. The bridges will be down. Any rail service impossible due to twisted rails. The waters sloshing about so boat service is inconceivable. New York City is claimed to be footed on solid rock, which it is, but solid rock can shift, pull apart , and create havoc. Are there signs this has recently happened? 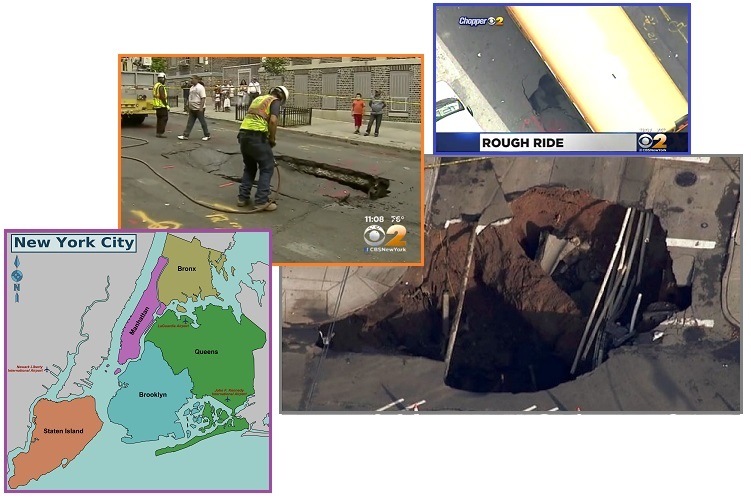 In quick succession two sinkholes opened up in New York City during August, 2015 – one in the Bronx and one in Brooklyn, as noted on the Pole Shift ning blog dedicated to tracking sinkhole incidents. A massive sinkhole has swallowed up an intersection in Brooklyn, New York, snarling up traffic and causing water and gas outages to nearby buildings. Dramatic images show the gaping hole in the corner of 64th Street and 5th Avenue, located just a short block away from the I-278, also known as the Gowanus Expressway, in Brooklyn’s Sunset Park neighborhood. There were no injuries. The bus went over what was then a small pothole, and ended up plummeting into what became an enormous sinkhole. The ground opened underneath the bus to something that was about 10 feet long and 6 feet wide. And then there was the case of 65 exploding manholes in Brooklyn in 2011, which the Zetas attributed to methane gas. These explosions happened over weeks, from the first of the year, and thus and were hardly due to maintenance on a gas line. 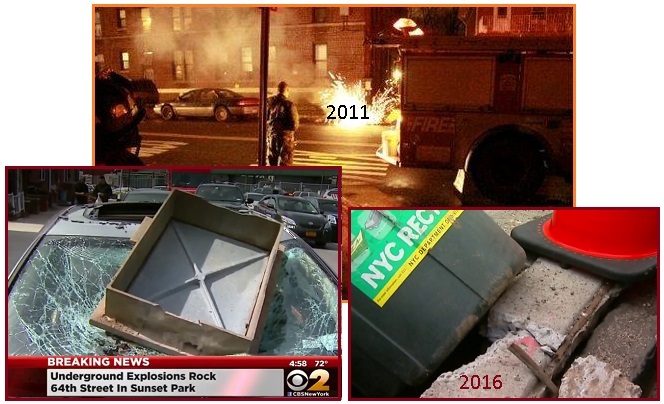 And recently, in 2016, unexplained explosions from underground, again in Brooklyn. There is a pattern here. A fireball erupting from a manhole in Brooklyn this week engulfed an SUV that had been parked over the opening only moments before. On New Years Day, a manhole blew in Manhattan's West Village, sending a 15-foot column of flames into the air. A passerby filmed the spectacle and posted it on YouTube. On January 18, manhole fires forces evacuations of homes in Queens, Brooklyn and the Bronx. The utility giant said there have been 65 manhole incidents since January 1, nearly a score of them in the last four days alone. Con Edison was still investigating – but believes a contractor named Royal Guard Fence that was working nearby hit an underground National Grid gas line, setting off the dangerous chain of events. There were two explosions. The utility box cover hit the bottom of a car that was parked right over it. A second cover flew into the air and struck the Lexus. ZetaTalk Comment 2/19/2011: New York City has been built on rock, the high rise buildings footed on rock, but this does not mean that methane gas has not accumulated between the layers beneath these footings. In fact, it is the footings themselves that are part of the problem. During a violent wobble, sinkholes and crevasses appear in stretch zones because the ground is pulling in first one, then another, direction. This drops soft soil down any vent that has been established by this action, and thus the sinkhole. In like manner, these vents can allow gas to rise. Stick a rod into the ground and move it back and forth, and what do you get? Soil or rock on either side will be pushed away from the rod, thus forming a vent for gasses to rise.